1. Mix the marinate ingredients and rub into chicken. 2. Keep aside to marinate for an 1 to 1 1/2 hours. 3. Heat oil in a pan over moderate heat. 4. Add the small onions and fry till golden brown. 5. Add turmeric powder and cook for a minute. 6. Reduce heat and remove the onions. Keep aside. 7. Add tomatoes to pan and fry for 3 to 4 minutes. 8. Remove from pan and add with small onions. 9. Add green chillies to pan. 10. Fry for a minute or two and remove from pan. 11. Add the chillies to onions and tomatoes. 12. Add mustard seeds and allow it to splutter. 13. Add the chicken pieces with the marinade. 14. Pour 1/2 to 3/4 cup of water. 15. Cover pan and cook for about 8 to 10 minutes till chicken is half cooked and the gravy begins to thicken. 16. Mix sugar with vinegar. 17. Add salt and ground paste. 18. Simmer for 2 minutes till gravy thickens. 19. Add the reserved onions, tomatoes and green chillies. 20. Mix well and simmer for 5 to 10 minutes longer till chicken is tender and coated with gravy. 21. Transfer to a serving dish. 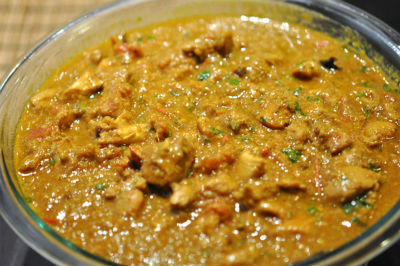 Feel free to comment or share your thoughts on this Spicy Chicken Curry Recipe from Awesome Cuisine.